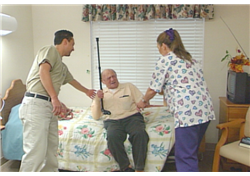 How does your staff respond when a resident exhibits aggressive behavior? This video will help staff better understand why residents react aggressively, and gives tips on how to minimize instances of aggression. It identifies many of the common internal and external factors that can trigger aggression, and suggests ways to improve communication while providing care. Includes the importance of developing individualized Behavior Management Plans. Includes manual with post-test.